Since installation of an AXYZ 4008 CNC router in January of this year, Newton Abbot, Devon-based RC Motorhomes, a specialist manufacturer of bespoke motorhomes, has according to Director Richard Churchill “revolutionized its manufacturing capabilities”. This has led to a huge increase in production, shorter lead times and a superior quality of end-product which collectively have contributed to a growing list of satisfied customers. Part of the AXYZ 4000 series, the 4008 router incorporates a seven-station AXYZ Automatic Tool Change (ATC) facility to increase both the flexibility of the machine and its speed of production. The router, which runs on VECTRIC design and production software, has a standard processing width of 1524mm and an expandable processing length of 2438mm. 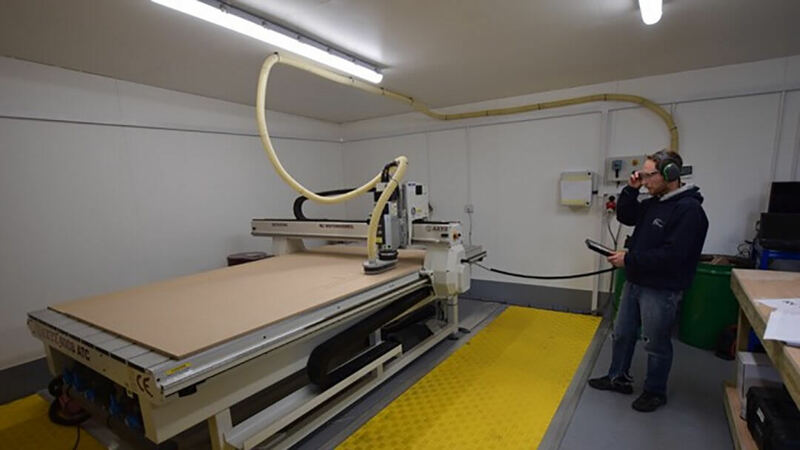 It is used to process a wide range of materials, including plywood, MDF, composites such as DIBOND, solid surface materials like Corian and aluminum and plastics. A big part of the manufacturing output carried out at RC Motorhomes involves interior furniture such as cabinets and shelving, the quality of which had to reflect the high standards already established when traditional hand-held methods of production were employed. In common with all AXYZ routers, the AXYZ 4008 is available with a host of optional machine tool enhancements. In particular, these include the AXYZ Auto Zone Management facility that ensures the material being processed is always held securely during the routing/cutting cycle and the latest A2MC machine control system that has a massive 16GB of memory for program storage and network connectivity to enable error-free program transfer. Further options include the AXYZ AVS (AXYZ Vision System) for precise material alignment and the latest helical rack and pinion drive system. This features a multiple gear teeth configuration that helps spread the workload more evenly, leading to faster throughput speeds, greater accuracy, reduced material wastage, quieter operation and ultimately a longer than normal machine life. For further information on AXYZ routers, visit www.axyz.com or call 1-800-361-3408. For more information about RC Motorhomes, visit www.rcmotorhomes.co.uk.